While there are an infinite amount of opinions towards the state of the world, I will attempt to keep it at the pattern level and myth bust a bit. In nature, biodiversity brings stability and resilience yet across so many systems on the planet, (economic, social, environmental) we are creating monocultures. It’s the homogenization of culture, not necessarily globalization, that has brought so much entropy (loss of energy) to our systems. For example look at the picture bottom left on the slide below and please tell me where this suburban development picture is from. Automatically people will say the states but I have seen suburbs in Portugal sprouting up like this. And even if it is in the states, where? It has no cultural identity, has no design based on how nature works (permaculture principles), and is such a consumer of energy that its failure is obvious. The loans to build such neighborhoods where at the backbone of the financial crisis tipping in 2008. 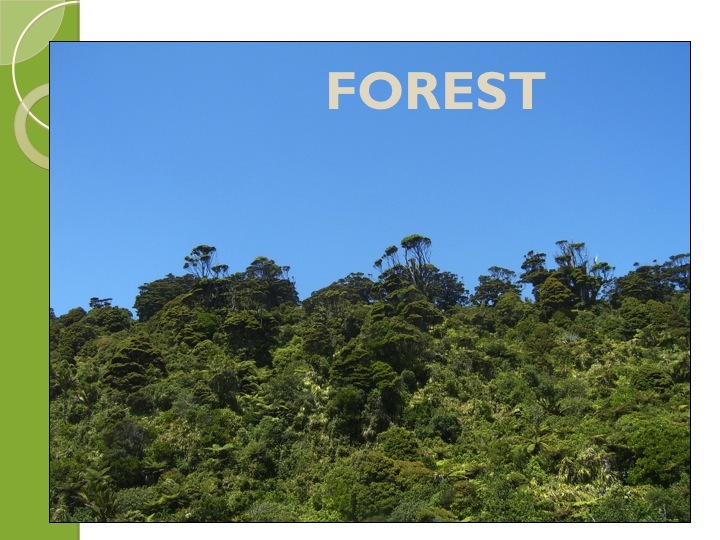 Moreover, the monoculture forestry operation on the top left below could also be anywhere. Maybe its Australia, Portugal, or Mozambique. It’s forestry that displaces so much life that even the toilet paper we use can’t be considered cruelty free or vegan just as Mark Shepard exerts in his wonderful read Restoration Agriculture. And surely not the monoculture wheat field seen top right, which I have become so accustomed to seeing having worked in Iberia for so many years now. The amount of toxins poured into these monocultures is astounding and while they produce food they also constribute so much pollution and are so inefficient that they are propped up with government subidies. Without them, it would not even be possible to turn a profit in this grotesque game of globally reticulated food/ fiber production. in societal history. If we think this is the only time in history that this pattern has happened, we are mistaken as all the great civilizations of the past collapsed from this esssentially. But the pattern begins with a diverse and complex forest, or local economy, or interactive community, as this metaphor is seen across many different systems. The forest has many players, many elements interacting symbiotically and building energy from complete cycles. Water infiltrates, biomass is cycled and while in constant flux, its inherent quality is stable, diverse, and complex. they were rotated between the two so that some level of fertility could be maintained. They take huge amounts of energy to prop up, as discussed above, and so much wildlife is displaced, so many microorganisms are killed that it is anything but sustainable or vegan. Loss of energy is massive as the amount of photosynthesis is dramatically lessened through the reduction of layered growing, soil microbes are early in succession, water runs off much more than infiltrating and it becomes a vicious cycle of degradation. Diversity and complexity are lessened as we apply modern farming techniques and loose our pattern based rhythms of rotation of crops and animals. Technology tries to save the systems with synthetic fertilizers and the myriad of agrotoxins that follow the plough and fertilizer. And if it were in the realm of a local economy, the big box stores have moved in, manufacturing has been shipped overseas, dramatic mechanization has occurred, wealth concentrating. Essentially homogenization is rampant and the cultural identity of small business and local living is erased. As the system degrades further and further, cyclical economies are hammered, the natural capital that once held the system is vanquished, and the social problems kick in as the desert forms. The sense of place is erased as the cycles are completely broken and vast amounts of energy are used to turn this tide. Wealth concentrates at such a level that inequality causes unbelievable amounts unrest. Another example is that while you may still see green corn grow in the midwest of the states and think its not a desert but having that much soil left bare, having a single crop growing, having water runoff with vast amounts of fertilizer, with toxins dumped at an unfathomable rate, photosynthesis only going for a few months, it is indeed a desert. The food yield is shipped to god knows where to be conglomerated into so many different products through the energy intensive corn processing manufactureing sector that farmers don’t even know who they are feeding anymore. The big box stores have no clue who their customers are and we are fenced into a society where individuality trumps community. When this happens consumption of its own self and its inherent capital keeps degrading the system. Its vicious appetite can never be fully quenched as debt props up the modern financial system just as fertilizers and pesticides do in agriculture. Energy production no longer comes from modern day stores of sunlight energy, rather fossil in their nature and their burning is extremely toxic. It’s borrowed time from an age that long has past and its repercussions are only now being fully grasped. Moreover, people congregate in all the wrong places and a sense of place and well-being is lost. Human health is propped up further through the pharmaceutical industry as physical and mental health degrades as it would if you were living in a vast sea of nothingness called the desert. Colonialism opens new markets and what was a rooted culture has now had the great crime of geonicide committed to it. Biocides poison our very sustenance. Medicines hook us into a treadmill of sickness. Debt is the shackles towards freedom. Holistic education is sparse like the plants in a desert. An oasis lies in the far off distance but people wonder if it is just a mirage that they can’t reach. 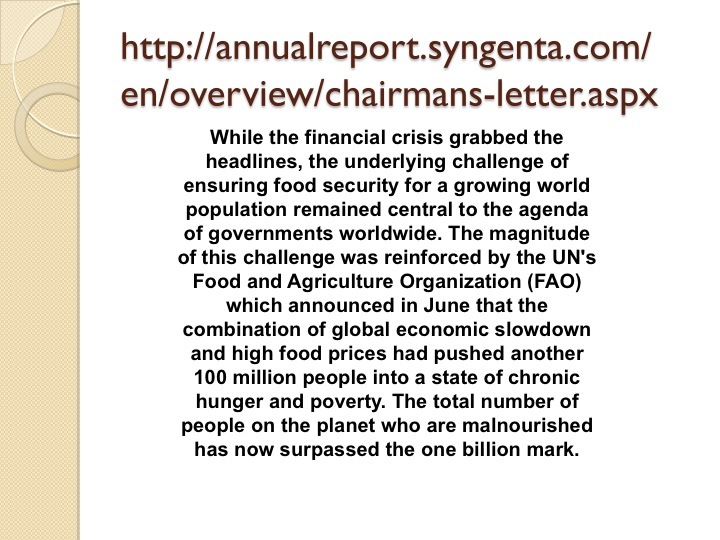 Please read the following statement from one of those big agro-chemical giants who claim their need to use them is to feed the world. It’s a bit wordy but important topic in the state of the world discussion. reached over 1 billion. So if they are feeding/ clothing the world through the vast energy consuming food and fiber production system, how are one billion people malnourished? Simply it is our financial system that has no ethic of fair share, earth care, and people care. 50% of all food is reported to be wasted because of its looks, its perishability, and the global shipping system. So yes indeed they produce enough for everyone but not everyone is fed. As Gandhi said, “their is enough for every mans need, but not every mans greed”. Much less the millions in first world countries who are starving to death, literally, on empty calories from the corn monstrosity all the while fighting autoimmune diseases like diabetes because of malnutrition. Obesity rages on in some locales while starvation increases in others. It’s a great paradox to have so much food at hand in some places yet others dont have access. But what is the cost of those who do have so much especially on the energy consumption to produce calories? The slide below comes from David Holmgren and his book Permaculture: Principles and Pathways beyond Sustainability. 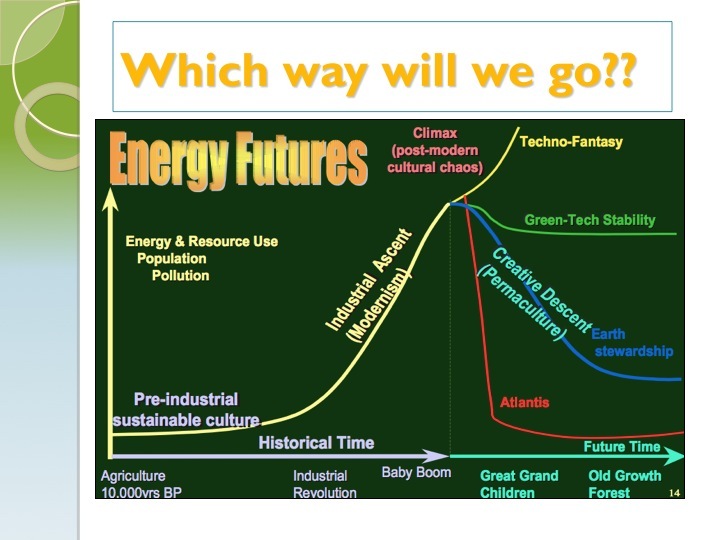 This graphic produces four scenarios of where the world is headed in a declining energy future. And despite the price of a barrel of oil hitting its peak just before the crisis of 2008 really kicked in at 147.50 dollars a barrel and now retreating, the world is indeed in a energy crisis. Places like the States recovered quickly through unspeakable means of extraction helping to generate vast amounts of fossil fuel resources that once were thought to be impossible, which indeed props up its economy. will continue to find new fossil energy sources and keep production high through throwing more energy and technology into the equation. Another scenario that is kicking in now to a certain degree is that our population stabilizes through the green tech stability. I see this as a time of transition where fossil fuel energy production is replaced with renewables like solar, wind, wave, and geothermal. Unfortunately all of these technologies have a lot of imbedded energy in them and without the fossil fuel industry their manufacturing would be impossible. So even the energy returns are often low despite the advancements in technology. It’s a step forward but keeps population and pollution relatively high. The next scenario is that we will use Permaculture design and other ecological design frameworks to creatively descend down this bell curve. With a society designed on how nature works blended with some forms of technology, our population, resource use, and pollution will top and then head gently downhill from there in a natural way. The stewardship of our final reserves and resources will become paramount and a more just society will spring forth as new social and economic systems are invented. And as Rob Hopkins said in his Transition Towns book, much social unrest will occur before this great turning happens. I feel this is where we are at in 2017, that we are seeing systems crumble in upon themselves and will require very creative thinking to supersede the old. Finally, the last scenario, one we must avoid, is the scenario of Atlantis where our culture simply falls of the cliff into a Mad Max scenario. Our society gets so out of control that total destruction is the only solution to take from the words of Bob Marley. It will be extremely painful thus further justifying the reason for using permaculture to create a smooth transition out of it. Population is an interesting topic within the world. If managed correctly we have a very abundant planet where we could produce enough for everyone. But it is natural, what goes up must come down. In the great book, Monkeys are made of Chocolate and humans are made of fossil fuels, author Jack Ewing states this above point eloquently. He had moved to Costa Rica and was a Cacoa farmer in his younger days. In the 70’s when the fuel crisis hit the market for Cacao also hit rock bottom. What he noticed after that was the local monkey population incurred a dramatic increase because there was a vast quantity unnatural food resources not being harvested; Cacao. Eventually when the fuel crisis was solved and Cacoa production hit the global market again the monkey populations declined steadily to a more natural rate. Another example of that is one that I know very well from living in Ohio and my studies in Fish and Wildlife Management for an associates degree finished in 2004. Every 17 years a plague of locusts, or as we call them cicadas, ascends from the ground and creates a vast protein source that year. Fish in lakes have growth in population just as turkeys do. The polts, young turkeys, have an incredible survival rate in that year because of this extra protein resource. The predators that feed off of turkeys also see an increase in their numbers as their is extra food resources for them as well. Eventually turkey numbers and predator numbers settle back in to a more normal number based on habitat. So we as humans have used the cicada, fossil fuels, to drive our population to a completely unsustainable level. However the problem is the solution so over population must be directed to repairing earth systems if we are to get out of this mess. Just as Roosevelt did in the 30’s, the last time a major financial crisis occurred, we must direct resources towards reforestation and other infrastructure to repair the cycles of water and carbon that stabilize our climate. like to bring it back to something simple in these moments to have all understand that if we work at the true root of the problem it is possible. 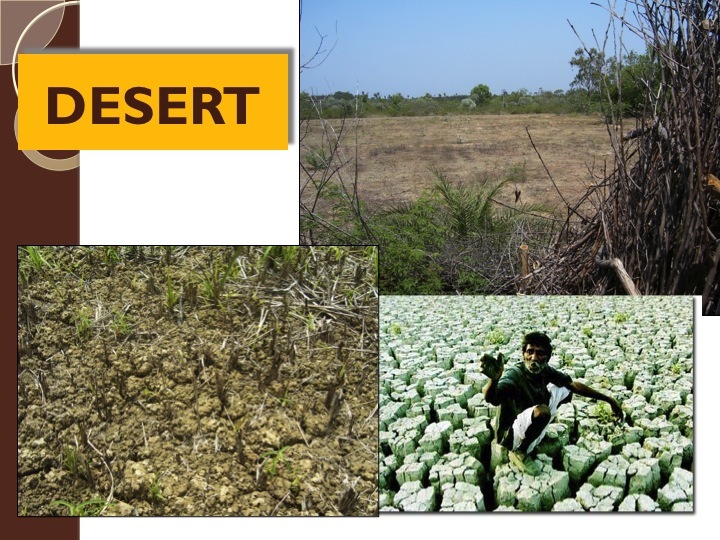 We first have to admit the same fear and greed that drive this desertification model are inherent qualities in our evolutionary background of emerging from animals into beings of consciousness. The same things of fear and greed that the banker on Wall Street or London uses as tools of destruction are seeded deep within each one of us. The violence inside degrades ourselves so much through egotistical rampages that rarely do we approach peace within. So how do we expect peace to happen in the middle east or towards nature when we ourselves don’t feel peace? And when confronted with things like money or power do we actively embrace fair share or are their moments when our instincts kick in and we hoard and manipulate to gain more. So when we move out of fear into a state of love, when we stop separating man from nature and mind and spirit as Des Carte gave to us, then evolutionary consciousness will occur. Then and only then can a creative descent occur and its one that requires moving away from the rational, dualistic model inside us to one of balance with the pattern based understanding of holism and complexity. Yes I am attacking the very system I depend upon with words yet work hard every day towards shelter and gardens. I try to consume as lightly as possible, meaning when I do it goes towards small local business and farmers. Of course its not always possible with air travel, telecommunications, and technology but I do my best. So in the end, the state of world can also be looked at this production and consumption pattern. It’s on each one of us to be producers, even if it is through consumption, of clean air, rich soils, healthy food, high quality and abundant water, fish and wildlife habitat, social equality, and equitable economics. Buy local food, develop cooperatives, share surplus, buy second hand clothes, capture rainwater, build your own house, generate energy through renewables, live lighter. I feel Bill was pretty clear on this throughout his writings and teachings and I am thankful that he stood up and demanded from this emerging counter culture that the ethics be engrained and these directions be sought. So the flip side of the coin is that there are so many good projects happening right now that despite the darkness growing, so is the light. So many trees are being planted, communities formed, eco entrepreneurship, non profits working on social issues, consciousness growing. The ethics blended together in a holistic way are allowing for this evolution. So please tell us stories of projects you know who are doing this regenerative work below in the comments. I have a garden I have just started in a small town in central Oklahoma. I would not call it “Organic”, since “Organic” still allows chemicals that I can’t afford and dont want on food. I’m sourcing all my compost material within 1000 feet of the property by trimming neighbors trees and grass, showing them that their “problems” are actually solutions. Next spring the permaculturing begins in full! Hopefully more gardens and food forests will be started in the future, while bringing back the positive aspects of the old style of farming/gardening. In small town America (under 2000 people) government aid is a way of life, drug abuse is rampant, sickness is the norm and a sense of futility is expected. This is not the way humans should live.